Paula Temple and Jem the Misfit are working on the latest iteration of a project about transformation. It melts and fragments, crystallizes and forms, from its rich palette of hybridized techno and ambient textures, sonic and visual alike. 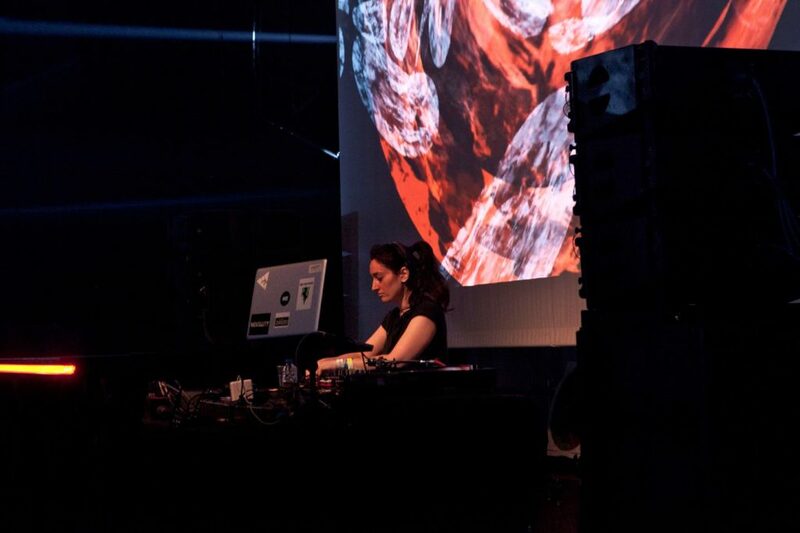 That makes for a perfect time for CDM to join the two together – Paul Temple, the techno legend (R&S Records) known for her brutal produtions, and Jem the Misfit, one of the top practitioners of live visual performance. Jem the Misfit (aka Jemma Woolmore), left, with Paula Temple, right. CDM: First, I think from an AV standpoint, it’s really significant that you’re together on stage. Obviously that sends a message to the audience, but what does it mean for playing together? Are you communicating there – even if just by your presence? Jem: Paula and I work closely together before and during the show. Being on stage physical is really important for timing and connection in the performance; we give each other verbal cues, but also react with our body language. We also work closely together before the show, practicing and discussing the ideas and flow of the performance. It is also important that we are both onstage to highlight that this is a collaboration between two artist working together to build the show. Jemma, it feels like what you’re doing is really cinematic, but it also breaks up that rectangle (with geometries, etc.). What’s your approach to the screen here? Of course, in the first version, you were in an actual cinema – where might this go in future? Jem: Breaking the regular rectangle of the screen is something I try to achieve in all my performances. With the Nonagon show, I have a clear geometric language built around the nine-sided nonagon form and I construct abstract forms using MadMapper to translate the visuals through these geometries. As you say, the Nonagon show is highly cinematic and was originally designed for a cinema context for our show at The Eye in Amsterdam. For Nonagon II at NODE, I am using a little less of the Nonagon geometries and instead moving from these fixed, tight geometries, eventually breaking their borders and allowing the visuals to flow across the screen as the show develops. I am also interested in putting emphasis on light intensity and color to influence mood in this version of the show. In future iterations I could envisage this leading to more development in using lighting as well as video and bringing the geometries off the main screen and out into 3D space. Paula, this is a different sound world than a lot of people know from you. Is there a connection to the techno productions they may know better? Does that impact the approach to timbre, to rhythm? Paula: I think it is the same sound world, just not as strictly dance floor-aimed. But I know what you mean, it even surprises me how people who follow my music easily recognizes my style in my more experimental live sets. It is one reason why I prefer to perform the experimental sets at festivals such as UNSOUND or INTONAL or the NONAGON II AV at NODE; the crowd knows my music more like an emotional expression and can therefore connect to the music beyond a released piece of music. There’s still recognizable elements, like from my track called Deathvox. When I’m producing I never consciously think about timbre or rhythm — that way of thinking is too detached. I’m feeling emotionally, I’m opening my sensory gating channels, connecting feelings into electronic sound without thinking too technically, and therefore being deeply immersed in that state to give a translation of those emotions through sound. People who really like my music seem to be tuned into that state too. Can you tell us a bit about the sound world here? What are its sources; how was it produced? Paula: The sources to me are the thoughts and feeling that develop into these pieces. Lately, they have come from reflecting on social injustices happening and dystopian dreams, or even falling asleep to movies and waking up at a scary moment! For example, one track has a working title called “Earth,” where I would have a recurring dream where everything green — plants, trees, vegetables — turns black and dies within seconds, and Earth is so hurt, so angry at what we humans have done, that Earth asks the Sun for help and asks the Sun to eat Earth. I remember at the time of making “Earth,” I was trying to watch the movie Melancholia and as always, I fall asleep and then I’m waking up as the movie ends, still half asleep, wondering what’s happening! When producing, I am working in Ableton Live, with customized drum devices I’ve developed in the last 3 years and jamming on my [Dave Smith Instruments] Oberheim OB-6 or a virtual instrument like Tension [in Ableton Suite]. You’ve changed the music here for this edition, I know. What’s new in this version? Paula: We’ve decided to keep the remix I made for Fink in the show as the lyrics literally relate to hope, not giving up. Plus there are new pieces relating to what Jem has also been inspired by lately, such as corporate made environmental or socioeconomic regressions and aggression, Entanglement or the Angela Davies book Freedom is Constant Struggle. Jemma, how did you work on the visual material; how was it influenced by that music? I know there was some shooting of stuff melting, but … how did that come about; where was the design intention on your side and how did you collaborate together on that? 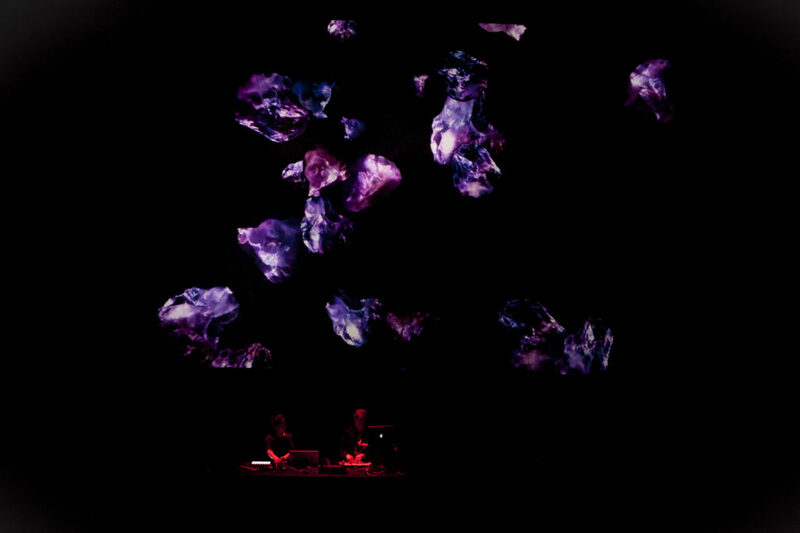 Jem: For the original Nonagon show, Paula and I developed the music and visuals in tandem, based around a common structure that included working in 9 parts and using 9 specific actions (such as distort, reverse, stretch etc) to apply visually or musically. This lead me to find ways of manipulating form both in virtual space but also using real forms, as you say, building and melting geometric objects and capturing this in time-lapse. So visually, Nonagon was about applying these specific actions to geometries and moving through a exploration of form, in connection with Paula also manipulating her sound in similar ways. 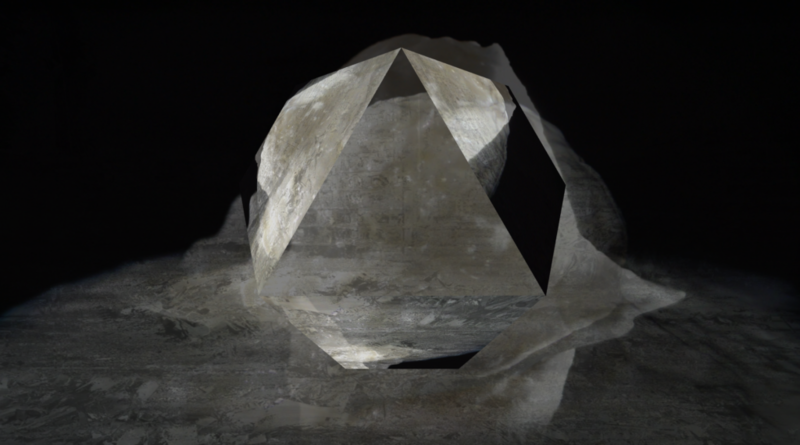 In Nonagon II, the focus has shifted from purely formal aims to more specific thematic ideas. When NODE approached me about performing at the festival, their theme ‘Designing Hope’ really caught me as a challenge, and I knew Paula would also be interested in tackling this theme. When I contacted Paula about NODE, we both agreed that we should shift the focus in Nonagon to try and address this idea of designing or generating hope through our performance – hence creating Nonagon II. Our approach to the theme is that there can be no hope without action. 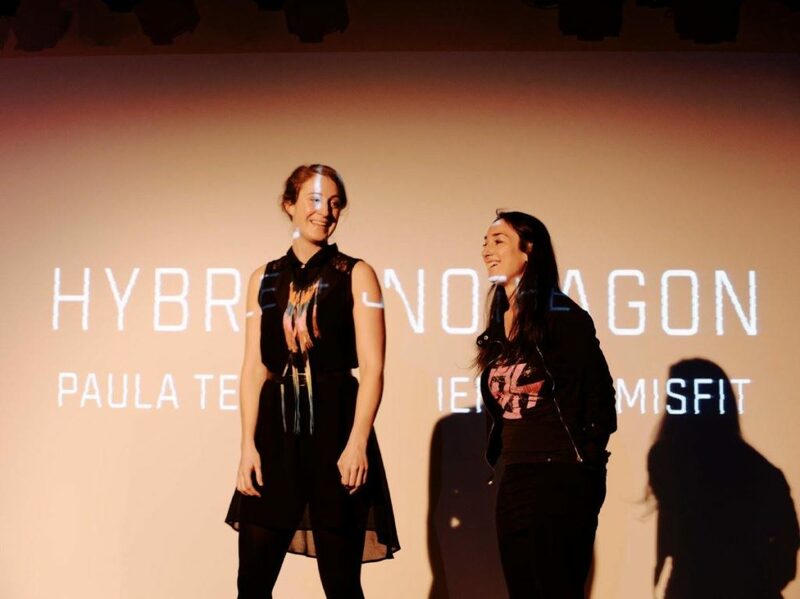 So as well as Paula’s action to donate her fee to the charity Women in Exile, the new trajectory for Nonagon II is to move from a place of fear through to an empowering place of action. Through the show we transition from simplification to complexity, individuality to multiplicity, fear to action. Visually, I am signifying this (again) through geometries that develop from simple shapes into complex systems, falling, melting and merging along the way, using color and light intensity to transform the emotional impact throughout the show. Interestingly, in the time since we last worked together – which is over a year – Paula and I have found that our ideas and development in our work have followed similar processes and align in many areas. We have both independently decided to use the term ‘entanglement,’ this idea that everything is linked and that over-simplification of systems, ignoring their relationship to one another is incredibly dangerous – for instance, the supposed self-maintaining economic system championed by neo-liberalism, ignoring its entangled relationship with climate and natural resource systems. We also have both read Angela Davis book ‘Freedom is a constant struggle,’ which also talks about building connections across political movements and the importance of moving outside narrowly-defined communities and working together. Also, the idea of acknowledging fragility in the balance of all our systems and having some humility in regard to our place in this universe has been important for both our practices. Can you each describe a bit your live rig onstage? Now, presumably we’re meant to be watching the screen, not you two, but is it important for you to be able to make this a live improvisation? For the visual set up, I am running Resolume [VJ/visual performance tool/media server] and MadMapper software, and using the Xone:K2 MIDI controller from Allen & Heath. There is no pre-programmed timeline in any of this setup, so it is all improvised. Paula and I like to practice the performance several times so that we have worked through the flow and impact of specific points in the show, but we are able to improvise fully making each performance unique. 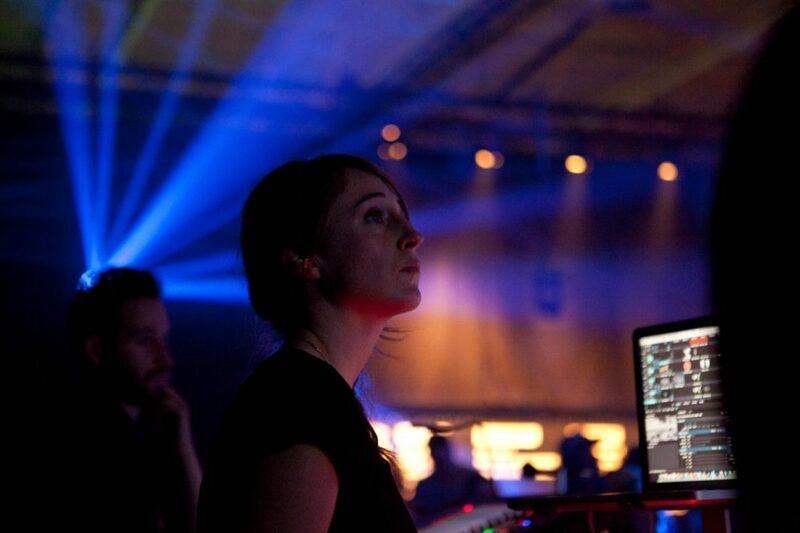 Paula: My set up is simple — Ableton Live, Push 2 controller and Allen & Heath K2 controller. I care more about the music working succinctly with Jem’s visuals to encourage the audience to feel, to reflect within or get a sense taking some kind of positive action, than about making it a live improvisation. “Designing Hope” is the theme of this year’s NODE. Paula, I understand you donated your fee – what’s your intention as far as doing something socially active, with this project, or with other projects? Paula: Considering the theme ‘Designing Hope’ came the simple question to reflect on, who needs hope the most right now? Then looking at who locally is giving hope and I learned about Women in Exile, a non profit organization founded in 2002 by refugee women who work closely with refugee women in and around Brandenburg and Berlin. In their activities, Women in Exile visit the refugee camps in Brandenburg to offer proactive support to refugee women from the perspective of those affected, to exchange information on what is going on and to gather information on the needs of women living in the camps. They organize seminars and workshops for refugee women in different topics on how to improve their difficult living situation and develop perspectives to fight for their rights in the asylum procedure and to defend themselves against sexualized/physical violence, discrimination and exclusion. They present the current issues, such as the hopelessness of deportation, to different organization nationwide in order to bring awareness to refugee women issues to the society. They give an incredible amount of energy and support to women whose world have turned upside down. Donating a fee is the least we could do. We hope, with our best intentions, is to invite others at the event to think about who are we designing hope for. Jem: I think we are both excited about being involved at NODE this year and interacting with a community that is working at the intersection of technology and art as well as pushing ideas around how art/tech crossover can be used to inspire communities outside of art+tech. This is where I see our performance fitting even if we are not specifically using VVVV. Personally, I am looking forward to a few extra days at the festival and exploring the possibilities of VVVV, as well as meeting at the VVVV community and exploring possible crossovers in our work.